Up to 400mm rain may drench the Gold Coast by the end of the week, along with strong winds, high seas and dangerous surf conditions expected on Thursday and Friday. Check out our latest post for the most up-to-date info! A low pressure system over the Coral Sea is forecast to move closer to Queensland from Wednesday generating large and powerful easterly swells. As the low continues heading west, a strong surface trough may extend over southeast Queensland Thursday and more so Friday - and if so producing heavy rain, showers and storms over the southeast districts, and dangerous swells. When will it rain? Check the latest 3-hourly detailed forecast. Weatherzone forecaster Ben McVurney said to the Gold Coast Bulletin "the Gold Coast Hinterland could be hit with up to 400mm s of rain in the lead up to the weekend." 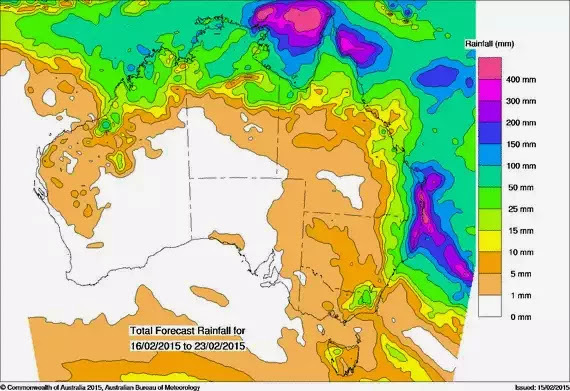 “There could be up to 200mm a day on Thursday and Friday and there could be a storm or two as well,” he said. BOM spokesman Jeff Carey said people in low lying areas should start to prepare for flooding. “It is a dynamic situation with lots of variables so the predictions are changing every hour or so but the Gold Coast should be getting hit with around 100mm. Partly cloudy. High (70%) chance of showers, most likely in the late afternoon and evening. Winds southeasterly 25 to 35 km/h. Cloudy. High (80%) chance of showers. The chance of a thunderstorm. Winds southeasterly 25 to 35 km/h increasing to 25 to 40 km/h during the morning. Large and powerful surf conditions are expected to be hazardous for coastal activities such as rock fishing, swimming and surfing. Cloudy. Very high (90%) chance of rain. The chance of a thunderstorm. Heavy falls possible. Winds east to southeasterly 25 to 40 km/h turning northeasterly 35 to 50 km/h during the morning. Some uncertainty persists with the forecasts early in the weekend given uncertainty regarding the movement of any tropical systems. Rain areas may persist over the state's southeast on Saturday, but it is more likely that the rain will be easing to showers.